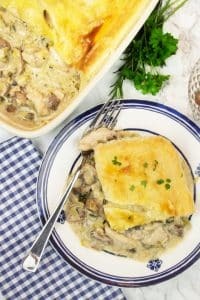 Creamy Chicken Pot Pie with Mushrooms | Simple. Tasty. Good. Doesn’t this creamy chicken pot pie look absolutely amazing?! Let me guess, that’s exactly why you clicked through to see that recipe behind it! Am I right or am I right? Well I can’t blame you: when I saw this picture, I was sold straight away! Hold on, what do you mean: first time? This is the very first guest blog post on my recipe website! A couple of weeks ago sisters Irena and Cyna – who I’ve known for some time now – behind the blog Country Hill Cottage reached out and asked me if I would be interested in doing a blog post swap. I didn’t have to think long and hard about an answer: yes, of course! So here’s the plan: I make a brand new recipe for their website and they do exactly the same for mine! We swapped a few recipe ideas and came to a quick decision. Irena and Cyna were making a creamy pot pie with mushrooms, I was going to prepare a chicken stroganoff. Amazing, right! Both recipes contain pretty much the same ingredients but the end result is quite different in look and flavor! As soon as I received the chicken pot pie pictures, gosh I just wanted to dig in. Look how inviting this pie looks! It’s creamy, chunky, absolutely packed with the most amazing flavors… You have to give this one a try for sure! If that’s alright with you, I’ll stop here and I will let Cyna do the talking. All that’s left for me to do is 1) to thank Irena and Cyna for their amazing invitation! and 2) make a grocery list and run the the shop to make this creamy chicken pot pie myself! 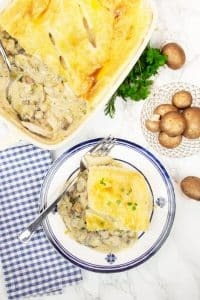 This easy creamy chicken pot pie with mushroom is comfort food at its best! 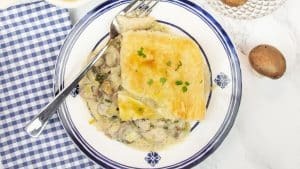 Tender chicken, leek, and button mushrooms are simmered into a succulent, flavoursome filling, and topped with crisp golden-brown puff pastry. The extra creamy sauce is made with chicken stock, creme fraîche, and seasoned with fresh herbs and white wine. The recipe can be prepared in less than an hour, making it a great dish your family will enjoy on busy weeknights. 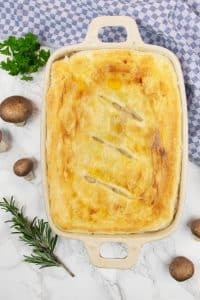 While we planned this guest post, June pointed out that the pie reminded her of chicken vol au vent, a Belgian classic, which I find perfectly fitting for this Belgian-British collab. I hope you enjoy the recipe and look forward to welcoming you on my blog Country Hill Cottage! My family loves chicken dishes in all forms (try my one-pot rice with chicken and peppers or these juicy chicken chops with cheddar) and this creamy chicken pot pie is no exception. I also like the versatility of the recipe. I have prepared this chicken pot pie for many years and often swap ingredients for things I have at hand. So let’s talk about the ingredients list! Chicken: Use good-quality, skinless chicken breasts or alternatively boneless chicken thighs or even turkey breasts – the pie will taste just as delicious. Leek: The recipe calls for 1 stalk of leek, which may seem a lot at first. But the leek melts down while cooking and adds to the rich, creamy flavour. If preferred, use 2 onions, or 5 green (spring) onions instead. Mushrooms: Mushrooms add to the depth of flavour and make the filling extra hearty. I used white button mushrooms, baby bella or portobellos are great options, too. Chicken stock: Chicken stock accentuates the chicken aroma. I made the stock with 1 1/4 cups (300 ml) water and 1 1/2 stock cubes. You can also use beef or vegetable stock, whatever you have at hand. Dry white wine: A splash of dry white wine enriches the aroma of the pie further. If you prefer to make the recipe whiteout wine, simply replace it with the same amount of chicken stock. Herbs: Herbs are a must to season chicken pot pie. I used rosemary and parsley, other herbs such as thyme, chives, oregano, or tarragon taste wonderful as well. If you don’t have fresh herbs, just use 1/2 teaspoon of 2 to 3 dried herbs. Crème fraîche: I prefer crème fraîche over cream for this recipe, as the former has a more velvety, indulgent texture and won’t split when combined with the stock and wine. Puff pastry: For convenience, I usually make this chicken dish with ready-rolled puff pastry and skip baking a pie bottom. Both fresh or frozen and thawed puff pastry are suitable, just make sure the pastry sheet is large enough to cover your pie dish. 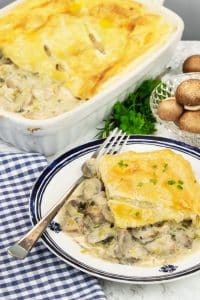 Creamy chicken pot pie with puff pastry: ready in under an hour! 1) Sauté the chicken and vegetables first. Heat 3 tablespoons cooking oil in a large skillet or pan over medium-high heat. Add the diced chicken, sliced leek and rosemary. Fry for 4 minutes while stirring occasionally. Then add the sliced mushrooms and white wine. Sauté for another 3 minutes. 2) Combine the cornstarch and 2 tablespoons of chicken stock in a small mixing bowl. Whisk thoroughly until no lumps remain. Add the remaining chicken stock, crème fraîche and cornstarch to the pan and simmer for 5 to 10 minutes until thickened. Add the parsley and season with salt and pepper to taste. 3) Preheat the oven to 350°F/180°C/gas mark 4. Grease the bottom and sides of an ovenproof pie dish with 1 tablespoon of cooking oil. 4) Unroll the puff pastry sheet and cut out slightly larger than the pie dish. Spoon the filling into the dish and spread out into an even layer. Cover with puff pastry and tuck the edges into the sides of the dish. Using a sharp knife make 3 cuts into the puff pastry so the steam can escape while baking. 5) Mix together the cream and egg yolk. Brush the puff pastry with the egg glaze and bake for 25 minutes until the pastry looks puffed and golden. Remove from the oven and let cool for 10 minutes before serving. Chicken pot pie tastes delicious served with salad, bread, or potatoes!